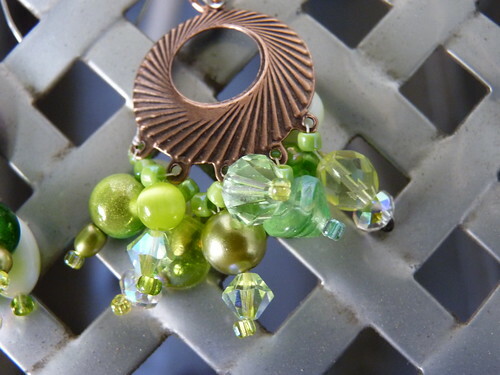 Explore unique jewelry designs from Momma's Green Beads. You can see the rondelles on the far right side and on the bottom left. I just love the way they look! That's a really neat look that I haven't seen before. Really dynamic earrings, with the swirling lines & the dangly green bead mix! Join my Facebook Fan Page and Win! A jewelery designer clawing her way up the Internet jungle. Looking for contacts and friendships with other talented people along with just being fun and having fun! This is the life of Momma's Greenbeads, some of the most unique and bold jewelery on Etsy. Large, fringe necklaces and bracelets with victorian offerings can be found on Etsy! Read this blog for jewelry hints and tips, contests and special savings and general fun with a wonderful attitude and perspective.